Question: Some people claim that the bar Industry brings a substantial net income to City Hall coffers, and that without it, the City could not balance its budget. Is that correct? Answer: No. The bar Industry operates with a subsidy from the rest of town, necessary due to the Industry's heavy demand for police and other City services. Much of the money to provide the subsidy came from historical increases in citywide property tax revenue - mostly from the residential sector - up as much as 19% in one previous year (2007). More recently, the boom ended, and the City began to look for new sources of revenue. In 2009 the City was quietly moving forward to impose a new "sewer fee" to raise $9 million, but on Oct. 27, 2009 the council voted to delay the hiring of a consultant to facilitate the fee. (We already have a sewer tax, the 6% we pay on our utilities, but the money has been diverted for general purposes.) In late 2010 they proposed raising the guest parking permit fee to $300, but dropped the proposal after heavy community opposition. Also in 2010 they set up a committee to begin a review of business license taxes. They also hired a consultant to do a separate review of other City fees. In March 2011 they received the consultant's report which recommended, among many other new or increased fees, that the Hermosa Arts Foundation be charged for its use of the City's theater and that the Hermosa Beach Little League be charged for its use of the ball fields (see the article in the Mar. 31 Beach Reporter). In June 2011 the Council approved a $750,000 increase in fees applicable to everyone living or working in town. Kit Bobko, Thomas Brodie, Andrea Jacobsson, Brittny Tacker), also available on the City's website. ... the Committee's current proposal (presented Jun. 6, 2011) was to tax the largest restaurants just $6750 annually. This FAQ was originally prepared in 2007, during the pendency of the Sharkeez referendum. The portion below is, except where noted, unchanged from what was posted here at that time. In February 2007 the City's Finance Department staff made a two-page tabulation of the downtown costs and revenues experienced by City Hall during Fiscal Year 2005-2006 (July 1, 2005 to June 30, 2006). We obtained a copy, and those pages are reproduced below, in their entirety. Below each page you will find our detailed discussion of the City's numbers, as we disagree with staff's methodology. [Post-referendum note: We asked the City Council to have a cost-revenue analysis done by an independent expert - and in early 2008 they agreed that they would do so, as part of the study to create a downtown Specific Plan. Unfortunately, the Specific Plan study has not been done, nor has the independent cost-revenue analysis been done. If they ever do engage an expert, we would emphasize independent - that he or she not be associated with any firm which presently does recurring audit work for the city or is likely to be bidding on such work. The City of Fullerton did a detailed analysis, albeit by City staff. Fullerton Report - Initial (8 mb doc file) Fullerton Report - Follow Up (3 mb doc file) ] Questions about Hermosa's tabulation should be directed to the City Manager. City's Downtown Costs 2005-2006 tabulation, received March 27, 2007 from City Manager's Office. Below is vivahermosa.com's table, with numbers revised, and added, to reflect City Hall's costs we believe are attributable to the bars, not to the entire downtown. This table does not take into account the costs experienced by the private sector - primarily wear-and-tear on the neighboring residential community. This table was prepared and posted here in 2007. A. The City's figure represents 4.5% of the $14,500,000 budgeted 2006-2007 for police and fire. We used a more realistic 30%. B. We estimate that the bar scene doubles the cost of street cleaning in the downtown. We used 50% of the City's figure. C. The cost of these holiday celebrations and special events is not attributable to the bar scene. D. These expenses will not repeat in the future. E. We used 50% of the $900,000 budgeted 2006-2007 citywide. F. The cost of the many bar scene lawsuits brought against the City is difficult for a member of the public to determine. We used 50% of the City's 2005-2006 liability insurance budget. We did not use the 2006-2007 budget figure as it has been inflated by $500,000 needed to defend the MacPherson oil lawsuit. City's Downtown Revenues 2005-2006 tabulation, received March 27, 2007 from City Manager's Office. There is a later version - See Note M. below. Below is vivahermosa.com's table, prepared in 2007, with numbers revised to reflect City Hall's revenues we believe are attributable to the bars, not to the entire downtown. This table was prepared and posted here in 2007. Note added 8-22-07, post-referendum: On 8-21-07 we received an updated copy (dated 4-24-07) of the City's Revenue sheet showing a new property tax figure of $92,194, a 79% decrease from the figure we received on March 27. (They had overstated their revenue by 365 percent!) The City's revision changed their total Revenue figure to $3,554,378, a 9% drop. We stand by our original $40,000 estimate for the property tax from just the bars, as the City's new figure included all of the commercial buildings downtown. 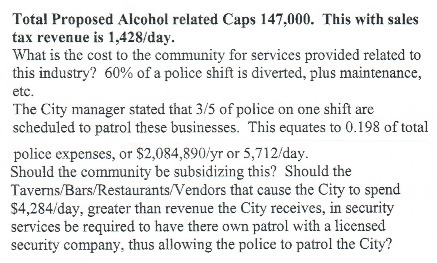 N. The actual FY 2005-2006 sales tax revenue from all alcohol-serving establishments in the downtown was $370,614, per a special report we asked the City Finance Department to request from HdL (their consultant) on March 27, 2007. We estimate that 80% of that amount came from restaurants with late closing hours. O. We believe that the bar scene contributes little to the occupancy rates of the lodging places downtown. P. The City's figure for UUT was based on the entire block of land, 8th to 16th, Strand to Monterey, including many non-entertainment businesses and hundreds of homes. Although the bars represent only 3% of the parcels in that block of land, we used 20% of the City figure, to reflect the heavy utility use typical of bars and restaurants. Q. We estimate that 50% of downtown parking fines and parking lot revenue is attributable to the bar scene. R. We estimate that 25% of downtown parking meter income is attributable to the bar scene, as meters do not have to be fed after 10 p.m.
S. The business license fee on a large restaurant (over 4000 square feet) with full liquor and live entertainment is $2086 annually. The City's figure was based upon the business license revenue from all types of businesses downtown, while our estimate is based on the business license revenue from ten large bar/restaurants. T. Figure revised 8-17-07, post-referendum: At the time we first did this tabulation (late March 2007) we estimated that 50% of the City's claim ($144,000) for downtown encroachment permit income was attributable to the bar scene, so we published $72,000. Subsequently - at the council meeting of 8-14-07, a city staff report indicated that the revenue from businesses open past midnight has been $89,000 and, with the "staged" fee increase voted-in at that meeting, will be $134,000 annually beginning October 2007, $179,000 beginning October 2008, and $224,000 beginning October 2009. Per our tabulations, the bar scene brings City coffers less than one quarter of what it costs to maintain - an annual subsidy of $3,982,000 flowing from the rest of the town. Those recurring subsidies may explain why Hermosa doesn't have some of the amenities enjoyed by other well-off towns. The City's 2009-2010 CAFR is available at CAFR 2009 - 2010. The staff report associated with the 2009-2010 CAFR is available at 2009 - 2010 Staff Report. The staff report associated with the 2006-2007 CAFR is available at 2006 - 2007 Staff Report.